The pupils of Scoil Chiaráin Naofa, Stoneyford last week raised their newly-awarded Active School Flag, and began a week-long programme of activity to celebrate their official recognition as one of the country’s newest Active Schools. Established with the aim of getting schools more active, the Active School Flag (ASF) is awarded to schools that strive to achieve a physically educated and physically active school community. Scoil Chiaráin Naofa is now one of 24 schools (26%) in Kilkenny with ASF status. The raising of the ASF at Scoil Chiaráin Naofa kicked off a creative and busy Active School Week programme for teachers and pupils. The school undertook its own From Malin to Mizen Challenge last week that saw every student run some of the 598km distance from Malin Head to Mizen Head by 3pm on Friday, with progress tracked by the Active Schools committee. The initiative is the schools’ own version of The Daily Mile that encourages running or jogging for 15 minutes every day. Other activities implemented by Scoil Chiaráin Naofa for Active School Week included: an outdoor exercise class for all the pupils; a walk to school day with participating students earning a homework pass; a welly toss event; a school orienteering challenge; hurling training; a basketball skills lesson and swimming classes. Lunchtime and break-time activities were organised for all classes and active homework was given every day. Where possible, pupils were encouraged to make a special effort to cycle, walk or take an active form of transport to school. Pupils were also invited to bring and display photos of special achievements or activities outside of school on the Active School notice board during the week. The healthy drive continued inside the classroom too, with the entire school participating in the ‘Food Dude’ healthy programme that encourages the consumption of more fruit and vegetables. Active School Week at Scoil Chiaráin Naofa followed on from Sunday week’s hugely successful ninth Stoneyford 10K Challenge that featured a ‘1K Dash’ for children in which the whole school participated, alongside siblings and friends. More than 160 children in total were awarded medals for the ‘dash’ from the Stoneyford Community Centre to Scoil Chiaráin Naofa and back. The run preceded the main 10K race in which 300 adults took part, a 25% increase on last year. 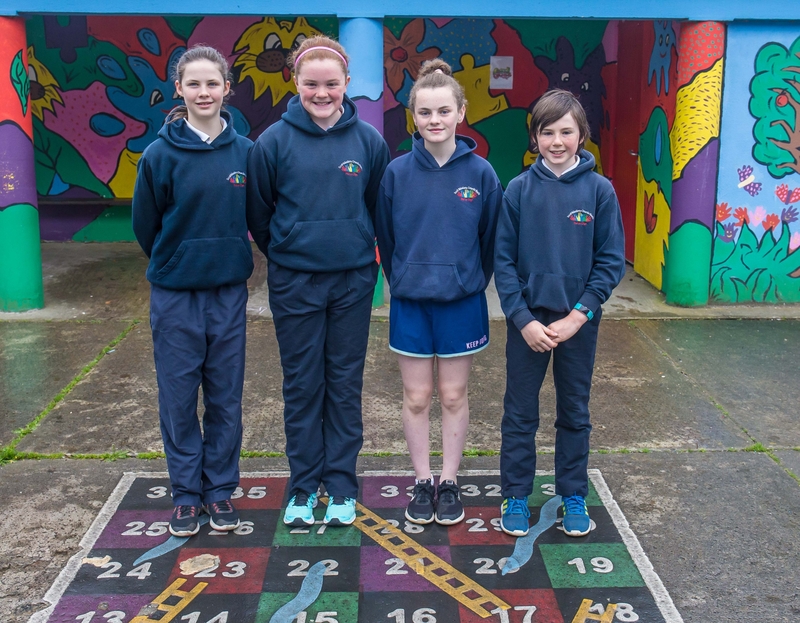 “To achieve the Active School Flag, we began a process by self-evaluating our current provision of physical education and physical activity and partnerships,” said teacher Naoise Ó Cuinneagáin, who coordinated the initiative. “Having met the criteria, we are delighted to have become an Active School. This accolade is a reflection of the healthy and active nature of our school community and our Active School Week programme will now become part of the school calendar. The Active committee of Lynn Fennelly, Aoibhinn Dunphy, Clodagh O’Neill and Max Butler deserve a special mention as they’ve shown great leadership throughout the process.